US 136's eastern end is interesting in that it does not end at another route. The through road at this intersection comprises the eastern end of the stub from I-74 west of I-465. Photo by David Greenberger, taken January, 2001. Signage on southbound I-465. 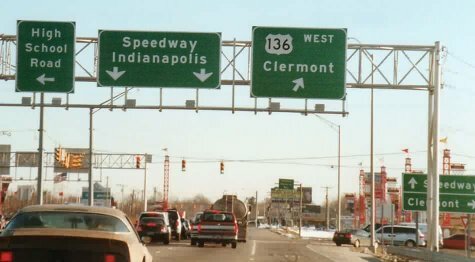 Exit 16A is the stub of "I-74" inside of I-465, but leads to the eastern terminus of US 136. Photo by David Greenberger, taken January, 2000.